With summer just around the corner, we’re leaving the winter months behind us and a dip in a nice, cool pool is sounding better than ever. If you’re out there wondering whether to go with an inground or an above ground pool look for no further help than from the team at Open Water Pools. 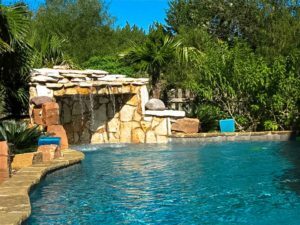 We are expert Pool Builders in Austin, Texas who are here to tell you all the pros and cons when it comes to the two main types of pools. Let’s get to the facts! Contrary to popular belief, above ground pools can be just as big in size as in ground pools. If not even bigger. Sometimes an above ground pool can actually offer a greater area of space than an in ground pool, but where above ground pools lack, in ground pools thrive. In ground pools are more customizable and can be designed in a variety of different shapes and sizes whereas above ground pools are typically limited to a circle or oval shaped. Although, when it comes to maintenance and upkeep it isn’t too different between the two. However, if you don’t have a sundeck around your above ground pool it may be a little difficult when it’s time to get around to cleaning it. Above ground pools also lack a change in depth, it’s typically standard for them to be one uniform level. Here’s where things get tricky. If you want a pool quickly and are running under a tight budget, an above ground pool is the way to go. They typically only take a few days to install and come at a much cheaper price than inground pools. Realistically, when it comes to a patio, deck, landscaping, electrical hookups, and accessories like heaters, covers, generators, you name it; inground pools can cost anywhere from 30-70 thousand dollars whether it’s concrete, vinyl, or fiberglass. This is because it is a long-term asset to the home. The size of the pool as well greatly impacts its price. Most above ground pools cost about 4-12 thousand dollars without the cost of a deck installed. In this case, decking can actually cost more than building the pool itself. Whether you’ve included your above ground pool to the outdoor decking landscape or not, it is technically still considered a temporary asset. When you go to sell your home you may be surprised to see no added value to the property now that you have a pool. Whereas Inground pools do in fact add value to your home if or when you decide to move, especially if you happen to live in a climate where the weather is warm a majority of the year. Inground pools as well last over 20 years or more. Above ground pools can last anywhere from 7 to 11 years but their liners will have to be replaced within every 5-9 years, which can be very expensive in the long run. Ultimately it is suggested that potential clients get an inground pool, which is the greatest bang for their buck. Not only will it add to the value of a home, but the pool itself will last for years to come. Request a free quote from Open Waters Pools today!